When someone experiences back pain that is described as traveling along the path and the distribution of the sciatic nerve, it is called sciatica. It in reality is the symptoms of a spinal disorder rather than a disorder itself but it is one that causes a great deal of pain and discomfort for those who live with it. The sciatic nerve is the largest nerve in the human body, being as thick around as a finger in most people. Because of its size and locations within the lower spinal area it is easy for this nerve to become pinched and damaged, thus resulting in pain. This large nerve bundle is found between the 4th and 5th lumbar vertebra (L4, L5) and the first few segments of the sacrum. The nerve passes through and round several bones and channels and ligaments and extends from the lower spine, down through the back of the thigh, behind the knee, branches through the knee and calf and area and finally ends in the ankles and feet. When this nerve is affected at the source up in the spine is causes problems the entire way down, which is why sciatica pain can be so varied and so painful. But there is hope for those living their life with sciatica issues and discomfort and we here at Tree of Life Chiropractic have made it our business and our passion to help people live happier healthier lives without pain! 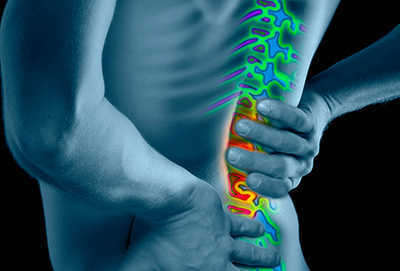 Symptoms of sciatica tend to affect one side more than the other in terms of the presence of pain or the severity of it. Pain from sciatica can range from stabbing pain to deep aches to dull burns and numbness and will often be worst in the lower back and then radiate down through the thigh, hip, knee, and feet. Sitting and trying to stand up can cause pain to flare and many people find that standing or sitting in one place for too long can also lead to pain flare ups and worsening symptoms. Coughing and sneezing can intensify the pain as it pulls the back muscles and can affect the nerve compression- bending and twisting will also generally be very painful as well. Sciatica pain is generally cyclic in nature as in there are flare ups and periods without pain. Herniated and bulging disc within the spinal column. Degenerative disc disease that weakens the spine. Lumbar spinal stenosis narrowing of the area where the nerves pass through. Isthmic spondylolisthesis that comes from fractures of the lower vertebrae. Spinal tumors and infections but these are not at all common. Between each vertebrae of the spinal column there is a spongy like material called a spinal disc. This material acts like a shock absorber and helps protect the spine and the all-important spinal column and nerves from damage due to everyday things like sitting, walking, running, and moving around. At times these disc become inflamed and they can swell of slip out of place- this is called a herniated disc. At times the herniated disc is so severe the material inside the spongy fibers leak out, which is known as a ruptured disc. A herniated or ruptured disc causes the vertebrae bones to hit each other and this inches and rubs the nerves and can cause pain and weakness and numbness. When this occurs in the lumbar area it can lead to sciatic issues. Herniated and ruptured discs are hard to totally correct and often times the focus is on preventing further damage and reducing pain levels. Spinal stenosis is a nerve compression disorder that usually is seen in older adults and is commonly consider a condition that is part of the aging process. The pain is usually positional and is brought on or intensified by certain movements such as standing, bending, or moving. This is why living life with sciatica is so difficult because so many basic activities can set it off or make the pain worse. As the spinal nerves branch out form the main spinal column nerve bundle they pass through passageways called neural foramina which are comprised of bone and ligaments and are found to the left and right sides of every vertebrae in the back. Nerve roots pass through these openings and then to their final location in the body. When these passage ways are narrower than normal or damaged, this is known as spinal stenosis and is among the most commonly reported sciatic pain. The only option in most cases to correct this narrowing affect is surgery. Spondylolisthesis is an ailment that occurs mostly within the lumbar area of the spine. It is categorized by one of the vertebrae slipping out of place so it slides into and pinches against the adjacent vertebrae. When a vertebra slips and is displaced, this compresses the nerves of the spine, including the prominent sciatic nerve and causes pain, numbness, weakness, and other symptoms. Spondylolisthesis is either developmental in nature, meaning it is present at birth or formed in early childhood or is considered to be an acquired from spinal degeneration that is the result of trauma, injury, overuse, or degeneration of the spine. Sometimes simple adjustments to the spine can correct it and get the vertebrae back in place but once an individual has spondylolisthesis they are more prone to repeat occurrences and often times it is not possible to shift the spine back into full alignment without surgery or other treatments. Sciatica and the nerve damage and compression that comes with it may be caused by external forces and trauma sustained to the lower spine area. Examples of injuries that can result in sciatica pain include motor vehicle accidents, sports injuries, job related injuries, trips and falls, and other similar injuries and impacts. The impact may injure the nerves or in some cases will break off shards of bone that become lodged in the nerves and cause damage. Surgery is the only option in most cases and it depends on the type and severity of the injury- often times it comes down to addressing the pain and reducing the chances for further injury and degeneration of the spine and nerves as a result of the injury sustained. Piriformis syndrome gets its name from the piriformis muscle and the pain that is caused when the muscle pulls the sciatic nerve out of position. The piriformis helps with hip rotation and connects the hip and the lower spine. The sciatic nerve runs beneath the piriformis muscle and when the muscle tightens or spasms or is inflamed this puts pressure on the sciatic nerve and leads to sciatic pain. It may be difficult to diagnose and treat in most cases, making this one of the hardest situations for living life with sciatica flare ups and pain. Spinal tumors, like all general tumors, are abnormal growths of tissue that can occur anywhere in the body. They can be benign or cancerous. Fortunately, spinal tumors are rare and make up the smallest percentage of cases for sciatic and lower bac pain. However, when there is a tumor in the lower spine area, compression of the nerves and damage to the nerves is common and thus can cause sciatic pain. If you think you have sciatica, call your doctor. They can perform the necessary tests to make sure you are diagnosed correctly so the proper treatments and care plans can be developed and implemented for you. The first step toward relieving pain is a proper diagnosis and this can be difficult to do at times and is something that should never be attempted on your own. Call us today and set up your consultation appointment and see for yourself why Tree of Life Chiropractic has earned a reputation for superior spinal health and care!